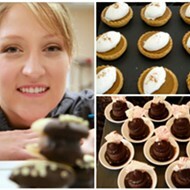 In her semi-regular column Real Life of a Pastry Chef, pastry sous chef Mary Boehne of Cielo (999 North Second Street; 314-881-5800) at the Four Seasons Hotel dishes on secrets of the trade and about the industry as a whole. This week's topic: holiday cookies. As I have mentioned previously I generally do not bake at home, but I have to make an exception during the holidays. I love getting together with my sister, mom and niece to bake cookies every year. It's not Christmas time without it. I try to keep it a relaxing -- not obsess about perfectly weighed flour or proper creaming technique -- and concentrate on little things, like letting my 3-year-old niece add the chocolate chips to the batter or catching her sneaking a taste while her mom's not looking. But if you are as OCD a baker at home as I am at work, I'll share a few of my own secrets to perfect cookies and my personal favorite recipe: the gooey butter cake cookie. 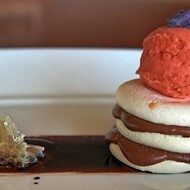 See also: How Does a Pastry Chef Get Her Dessert Ideas? 1. Properly measure your ingredients. The most important thing to measure properly is the chemical leavenor (baking soda and baking powder). No one is above the use of a measuring spoon! Fill the ingredients level with the measuring spoon to ensure it is the proper volume. Trust me, if an ingredient is even a teensy bit off, the recipe can be ruined and make for a spoiled batch. 2. Make sure to not over mix the butter and sugar. Over-mixing can result in a flat cookie. Using soft butter is better and creams quickly with the sugar. 3. Do not over mix the cookie dough itself. Beating the hell out of your dough will affect the texture and make it one tough cookie! 4. Always be sure to refrigerate the dough. Once you've mixed your dough, put it in the refrigerator for at least an hour before baking. This step keeps the cookie's shape and avoids it from over spreading in the oven. 5. Just because you made the dough does not mean you have to bake them all at one time. Pre-scoop the dough and place the balls on a cookie sheet. When they're completely chilled, place all of the dough balls into Ziploc bags and freeze them for later. They can be baked straight from the freezer, just place them right on the sheet tray like normal and place in a pre-heated oven. 6. And the ultimate top most of top-secret information... always use parchment paper! Parchment paper keeps the cookies from browning on the bottom while at the same time releasing them easily from the cookie sheet. If you still can't get the cookie right, there are always Toll House cookie tubes. I promise I won't tell. For those that enjoy a cookie challenge, I have found the book Southern Living Incredible Cookies by Nancy Fitzpatrick Wyatt is a great place to start for beginners and a great refresher for experts. It provides reliable recipes with lovely twists on the classics. Be sure to check out the brownie cookies, they are to die for. Click through for my favorite cookie recipe of all time.